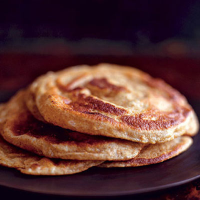 Flaky butter breads baked on a hot iron over a fire, like roti, are typical throughout central Asia and are good with simply grilled meats, simmered stews and dhal-like soups. Try sautéeing a little garlic with the butter and use this to brush on the dough before rolling, or scatter with a few sesame seeds. Place both flours, yeast, salt and sugar in a bowl and stir to a soft dough with the warm water. Cover and leave for 45 minutes, or until the dough is doubled in size. Generously flour the work surface and the dough and roll it as thinly as you can, aiming to get it 2mm thick and about 45cm square, dusting often with as much flour as you need to making sure it doesn't stick. Brush the surface with a thin coat of melted butter, saving any extra for cooking the breads. Starting at one end, roll the dough into a very tight cylinder about 45cm long and 3cm in diameter. Cut into six equal lengths, then sit on their end and pat down to a bun shape so that a swirl can be seen. Cover and leave for 15 minutes. Roll each of the breads out to 20cm in diameter and brush the surfaces with a little butter. Heat a heavy-based frying pan over a high heat until smoking and drizzle with a few tsp of oil. One at a time, place each bread butter-side down into the frying pan and cook for 1-2 minutes until the upper surface bubbles and puffs and the underside has gently browned in patches. Using tongs, flip the bread over and cook for a further minute, then remove from the pan and oil it again to cook another bread. Repeat with the remaining pieces and serve while warm.